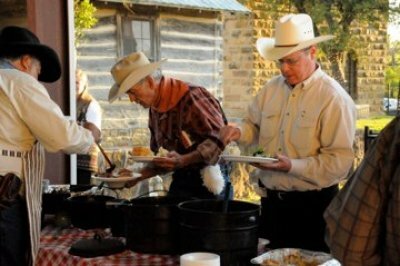 Entertainment Alliance has it all when it comes to braining the Old West to your event. What better way to bring the West to your party than live bands and disc jockeys? 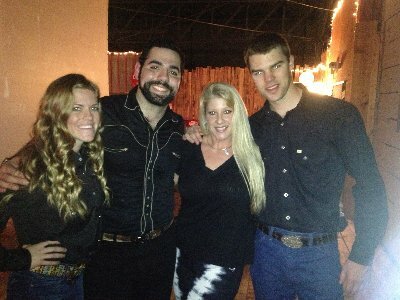 Our talented performers all come from the great state of Texas and can give your party the country atmosphere it needs. 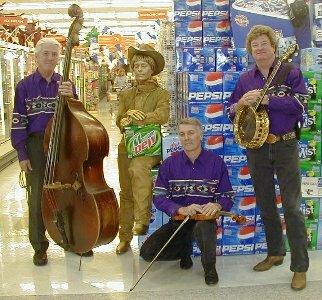 Our professional entertainers have shared the stage with many of Nashville’s finest, performed in some of the top venues and are guaranteed to get your guests up and dancing. 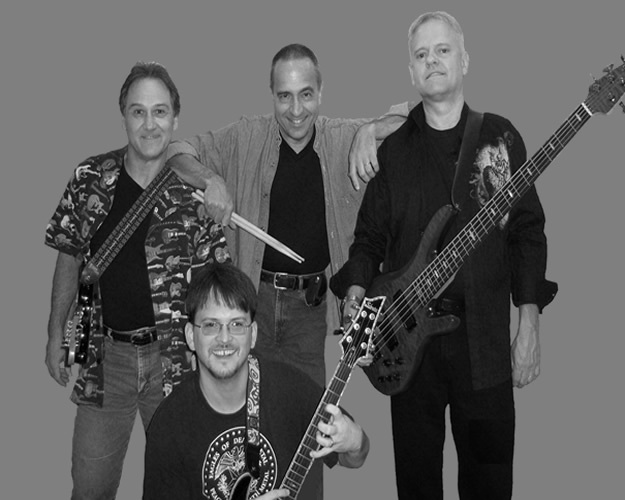 Rand L. Band consists of a talented group of musicians with over 30 years of experience in party and event planning. They can adjust the size of the band from 3 to 6 members depending on the size of your function. 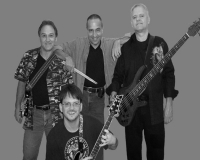 Rand L. Band can work with you whether you need a small group for an intimate party of 40 or a large group of 1,000 wanting a mix of Top 40, Country, Rock & Roll, 50’s/60’s/70’s. 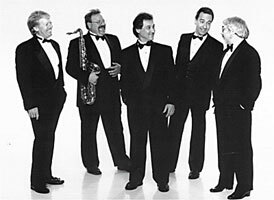 Breckenridge was founded in 1988 and specializes in the corporate and wedding entertainment market. Breckenridge has obtained a client base of some of the largest corporations and associations in Texas and abroad. From corporate parties, weddings, Christmas parties, and special events, Breckenridge can fit your needs. We offer more than just music. We offer flexibility and sensitivity to your desire to make your event truly exciting, successful, and memorable. 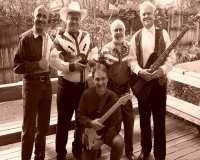 Liven up your barbeque with Scott & The Texas Twisters. The group can stroll and play acoustically, or if you want ’em staged with 5 to 7 pieces, they’ll swing San Antonio Rose like you’ve never heard it before. Besides all the Bob Wills favorites, they can throw in a little Willie and Waylon if you want. 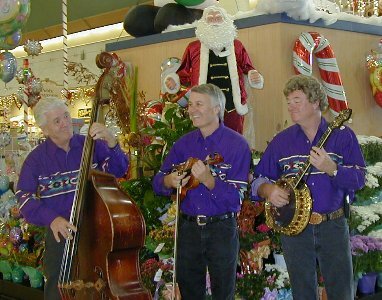 The Texas Twisters formats in 2, 3 & 4 piece strolling groups include: bass, banjo, guitar and/or fiddle. 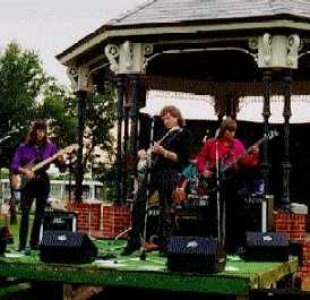 In the staged 5 to 7pieces we add three of the following: drums, tenor sax, steel guitar or a second fiddle. Saloon girls liven up your western party by greeting your guests and making them feel welcome. By adding the old-time feel of saloon girls who dance and entertain your guests. They pose for photos, give instructional dancing and keep solitary or shy guests from feeling alone in a big crowd by corralling them into fun activities. Those side liners, who aren’t comfortable with crowds, will feel encouraged and included. Image a showdown at high noon at the Ok-Corral, can you shoot as fast as Billy the Kid? Let your guests test their speed skills with our cowboy quick draw challenge. 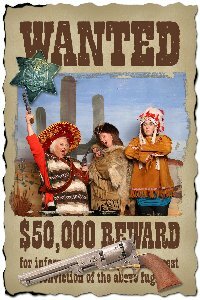 A thrilling challenge that will give your guests a challenge at your western themed event. 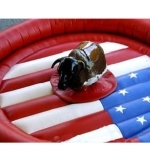 Mechanical bulls are a MUST for your western party event. Our bucking machines have state-of-the-art design and are fully controllable and safe. All ages, from 3 to 70 year old, can enjoy this exciting ride. No matter the experience level, our bucking machines are an unforgettable and safe experience for your guests. Give them a real taste of Texas with a bucking bull. 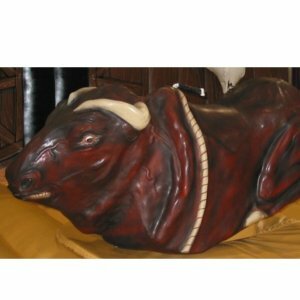 The mechanical bulls include a padded air mattress to surround the machine and a specially trained operator to ensure your guests safety when they fall off the bull. 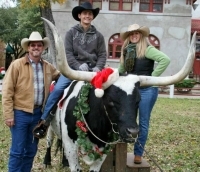 The bucking machine entertainment will draw large crowds of spectators and riders ready to show bravado! Let your guests capture the wild wild west in color or black & white old-fashioned photography. 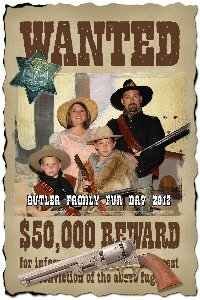 Old west photos provide fun take home memories for your guests to remember your event or party. 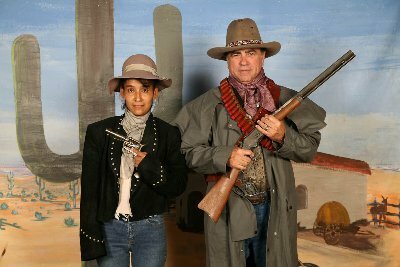 We provide old fashion clothing for your guests to put over their existing clothing and post in front of green screens where we add old western scenes. The photos are available minutes after the pictures are taken. 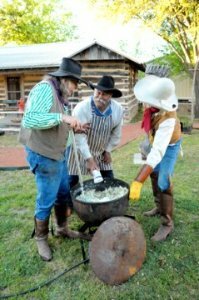 Enjoy a boot scootin’, two steppin’ country and western event with dance instructors who will get your guests up and dancing and interacting with fun western flair. Our dance instructors will instruct your guests even if they have never stepped on a dance floor before. 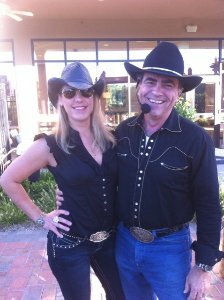 We can teach anyone any of our country and western dances from The Texas Freeze to simple two stepping, the classic Cotton Eyed Joe to the new, hottest western swing at your Western themed party. WE KNOW FUN!!! 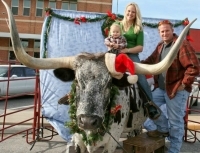 We provide for a small a Longhorn or for larger events Longhorns, a Longhorn handler, and someone who takes instant unlimited digital 4×6 or 5×7 photos. We average about 75 photos per hour. 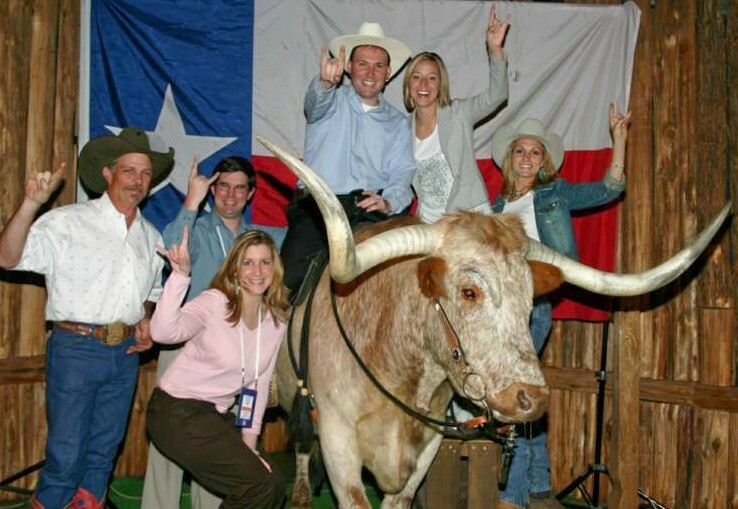 In additional, the set-up comes along with a Texas flag backdrop, rubber mats, plastic and out door carpet. We clean any and all messes up right away. 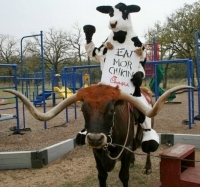 If the job is over three hours we bring another steer to be changed out half way through the event. 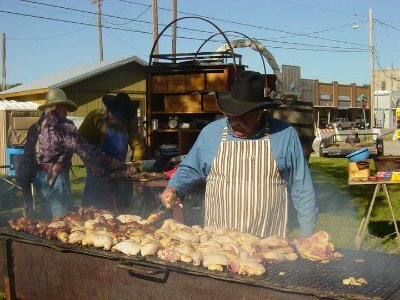 When it comes to a Western Event and you want to feed your guests there is nothing like a Chuck Wagon Cook-out. Our cowboys can cook-up just about anything you desire. 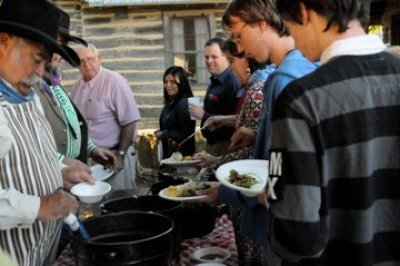 One of their main menu is BBQ beef, potato salad, beans, homemade bread, and cobblers. They bring chinette plates, plastic ware, and cups. There is no limits to how many they can serve. 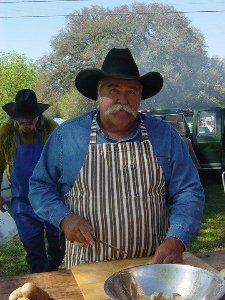 Everything includes: A real Chuck Wagon and gear, clean-up afterwards, we have a fire box for safety and do not have to dig holes for fire…cowboy dress. They can provide drinks (Lemonade, Ice Tea, and bottle water) if needed.